We came across this Christmas scene over the weekend on our way to the Legion of Honor to hear the organ concert, one of our favorite holiday activities. It struck us as something like an urban nativity scene, a modern creche, a non-religious holiday tableau. Santa's Visit. Click to enlarge. From left to right, there's the art director in blue, the white-haired photographer bent over his tripod, the elves (one ringing a bell, the other apparently the stylist), a few pet owners and one reluctant pet. Not to mention Santa with a dog in his lap. They assembled in front of Cal's Pet Supply. In the corner, you can see us manually focusing the old 35mm f2.8 Nikkor on our D300 as the car slowly inched forward at a stop sign. Professional driver, of course. We shot it at f8.0, 1/500 second and ISO 200. 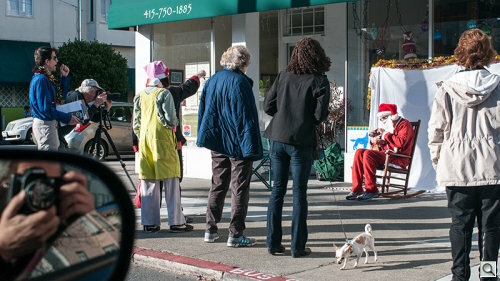 Cal's Pet Supply has posted a link to a video of the stills of Santa's visit.